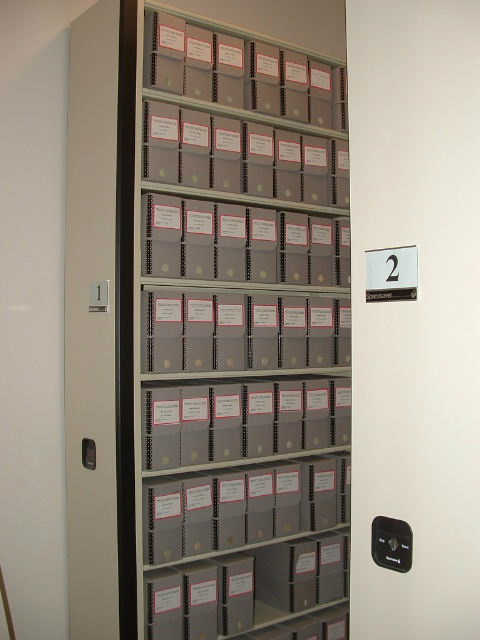 Governor's records stored in the State Archives vault. State Archives control number DSCF-0052. An attempt in 1967 to abolish the Division of Archives and establish the Nevada Historical Society as the sole repository of archival records failed. Various laws pertaining to state and local historical records were amended to clarify that the Division of Archives, not the Nevada Historical Society, was the official repository of noncurrent state government records (Statutes of Nevada, 1967, 1270. In 1973, the Division of Archives name changed to the Division of State, County and Municipal Archives (Statutes of Nevada, 1973, 345.) In 1975 the Division of Archives moved from capitol annex to 1807 N. Carson Street and in 1977, the Division of Archives was given responsibility of adopting regulations providing for categories of old records and minimum retention procedures by local government records (NRS 239.125). 1983 marked the year that the Records Management function, exclusive of the micrographics program,­ was transferred to Division of Archives and the name changed to the Division of Archives and Records. This changed again in 1985 as the name changed to the Nevada State Library and Archives (NSLA). The State Historical Records Advisory Board was created in statute in 1989 and it was the first such Board created by law in the nation. Also in 1989, the Division of Archives and Records moved from 101 S. Fall Street to a temporary location on Highway 50 East so work could begin on the new NSLA building at 100 N. Stewart St. Unfortunately, during the move, the oldest record in State Archives was stolen resulting in time-consuming police investigations, criminal trials in Carson City and Douglas County, ending with convictions and the recovery of the records. The Division of Archives and Records moved into new the new NSLA building and the Nevada State Library and Archives building opened to the public on January 3, 1992. NSLA became a division in the newly created Department of Museums, Library and Arts as part of general reorganization of state government agencies; the Division of Archives and Records lost its division status. In the State Library and Archives became a division within the Department of Administration as yet another reorganization in state government occurred. In 2015, the Legislature changed the name to the Nevada State Library, Archives and Public Records (NSLAPR).